The Mauerpark in Berlins district Prenzlauer Berg is a quite special park: as the German name suggests the Berlin Wall (German: Die Berliner Mauer) went right through the area, where today people enjoy themselves. Especially on summer weekends the Mauerpark can be packed with both neighbors and tourists, enjoying the green, having a ride on one of the swings, meeting and greeting each other, grilling, enjoying the show at the legendary ‘bearpit’ karaoke on sunday afternoons – or just doing nothing. On Sundays the Mauerpark hosts one of the currently most popular Berlin flea markets. The area next to Bernauer Strasse is then one massive shopping spree. Today booths with Berlin related memorabilia and Berlin related arts and crafts goods seem to dominate the overall picture – but there are also still some ‘traditional’ flea market stands where either professionals or neighbors sell antiques, clothes, records and the like. The Mauerpark Area next to the Flea Market is usually packed with people. Some are just taking a break from the Flea Market, others seem to be chilling in the shadows of the trees. And then there are often also several bands playing which can be a bit difficult soundscape, when you for example hear three parallel gigs from a little distance. 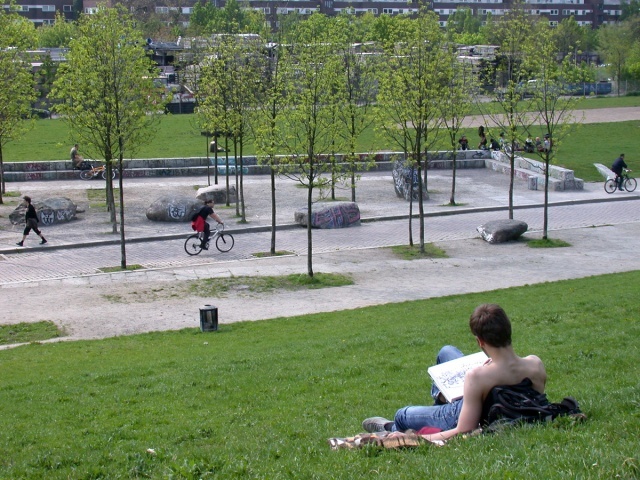 Since the Mauerpark is regularly overrun, the ‘Green’ may not be as green as one would hope. Usually the green is still quite in shape in April or May – but already after the First of May the green can literally be run down. On the 21st of June Mauerpark is also hosting a stage of the Fete de la Musique festival – leaving another ‘mark’ on the green of Mauerpark. The following weekends the green doesn’t get any better, especially if it’s not raining. So you probably would want bring a blanket or at least a newspaper to sit on, if you’re planning to sit down in Mauerpark. And please try to take everything with you, that you brought to Mauerpark – including all litter, cigarette buds, crown caps, etc. Otherwise it is very difficult if not impossible to keep the park clean and green. Before 1989 this area was part of the border between East– and West-Berlin – between East- and West-Germany. The Berlin Wall continued from Bernauer Strasse across what is now the Mauerpark and went up west (geographically) to where today the pedestrian bridge ‘Schwedter Steg‘ crosses the S-Bahn rails of the Ringbahn. Right in the corner of Bernauer Strasse / Mauerpark / Oderberger Strasse there used to be two watchtowers: one watchtower on the East–Berlin side that was used by the East-German border police – and one on the West-Berlin side, providing a view over the Berlin Wall and the border installations – the so called ‘death stripe’ (Todesstreifen). Already in 1990 the former ‘death strip’ was used as a ‘park’ by local Berliners. In 1994 the park was opened to the public. The current state is still ‘in progress’ –– originally the park should have been larger. It is still unclear whether the park will be expanded in the near future or not. Currently (2015) the park is still not in the shape, not in the size that was originally planned. There had been a series of difficulties – so the park was first built where it was possible. Originally the area that is today used for the Sunday Flea Market should also be part of the park. 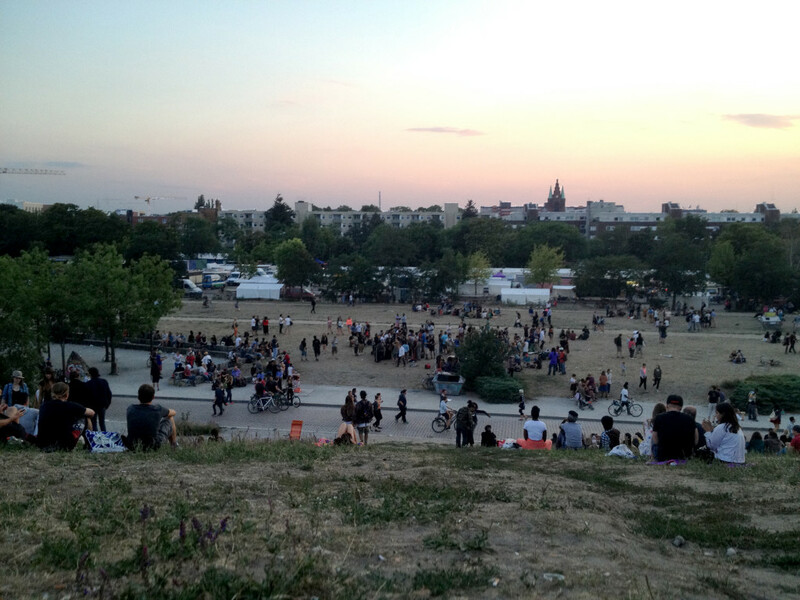 And also all the area from the flea market to the rails should actually be part of Mauerpark. The City of Berlin has sold parts of the area to some investor, planning to build apartment houses. Currently the investor is planning to build more than 700 apartments at the North-West end of Mauerpark alone. The negotiations are still underway – a petition against the project signed by approximately 7000 residents of Mauerpark neighborhood has been handed over to the City Council. As far as I know it is still not clear what the future will bring. One thing is for sure: the real estate project will have an impact on the park and how the park is used today. The past has shown that whenever / wherever condominium buildings were built in the recent years, clubs and bars and cultural projects had to face stricter rules. Many had to close due to complaints about noise levels. The park is open all day (and all night) every day, free of admission. You can access the park either from Bernauer Strasse / Oderberger Strasse / Schwedter Strasse or from Falkplatz. Near Bernauer Strasse the park has a special section for dogs where they can run free and enjoy themselves. So it is basically allowed to bring a dog to Mauerpark – but it is not really ok to let it run free outside the dog area. Take the U-Bahn U2 exit at Eberswalder Strasse and either walk 10 minutes down Eberswalder Strasse – or take the Tram M10 for one stop. Take the U-Bahn U8 exit at Bernauer Strasse and either walk 10 minutes up Bernauer Strasse – or take the Tram M10 for one stop. Take the S-Bahn exit at Nordbahnhof and either walk 20 minutes up Bernauer Strasse, which will also let you visit remaining parts of the Berlin Wall at Gedenkstätte Berliner Mauer (Berlin Wall Memorial) – or take the Tram M10 up Bernauer Strasse for three stops.